Trying to figure out what blog topic to discuss this week? New to blogging for your business and don’t have a clue what to talk about? I too find myself in this same predicament when it comes time to compose material for my monthly Germono Advertising Company blog post. This struggle sparked the idea of coming up with ten ideas to use when cultivating material for business blogs! People love lists because they are concise and easy to follow. Think along the lines of sharing your favorite apps, tools, restaurants, websites, products, resorts, stores, etc. The sky is the limit as long as you can tie it back to your business or industry to keep it relevant. Not only do “how-to” posts search well on Google, but your audience will love them! Be sure to make it simple and easy to follow. A great example would be “How to Find Your Next Home.” A realtor or realty company could go through the steps to take to ensure a smooth buying process and what to look for when finding a realtor. If you regularly create video content for your business this a simple way to turn those videos to blog content. No need to recreate the wheel when you already did the work! We recently implemented this strategy, turning our blog posts to video content each week. Videos can be a great way to expand on a blog post, so if you already have video material use your blog platform as a way to consolidate this content. This one is as simple as it sounds. Everyone loves getting to know more about a business and one of the best ways to do this is by highlighting an employee. Not only is this great blog content but it will also help boost employee morale. That’s a win/win if you ask me! Use your blog as a way to expand on a product that you can’t quite do on your website or one sheet. Talk about why you love it, why it is important, how it came about, and why your customers will love it too. If you don’t have a new product or service, talk about your best seller. Interviews can be with other leaders or experts who can bring even more knowledge about a product, service or industry. Consider interviewing a new hire or perhaps a loyal customer. Another great candidate for an interview is your business mentor. Check out some of our podcast interviews for examples! Do you receive the same questions time and time again from your customers? Use your blog as a way to expand on your FAQ’s. Have something big going on at your business? Blog about it! Let your audience know all about your exciting news and use your social media channels as a teaser leading up to your big announcement. This is similar to interviewing an expert but instead, they are writing a piece for your blog. You could cross promote your businesses at this time as a marketing initiative while boosting your blogs credibility with other industry or community leaders. Depending on how often you post, offer a weekly or monthly roundup of key things you learned, are loving or found useful. 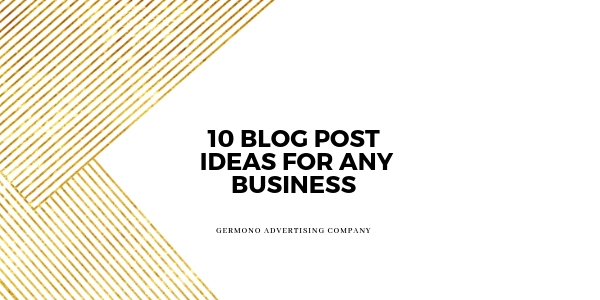 For example, if Germono Advertising Company wanted to do a monthly round up, we could highlight our favorite marketing article for the month, a new social media tool we learned, our favorite new app, a fun networking event we attended or a new restaurant we discovered. (Don’t be afraid to tie in something unrelated from your community on this one).